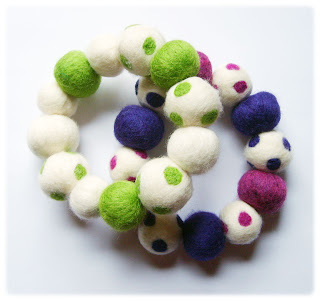 The Funky Felter: Handmade felted wool bead bangle bracelets - whoa, that's a mouthful! 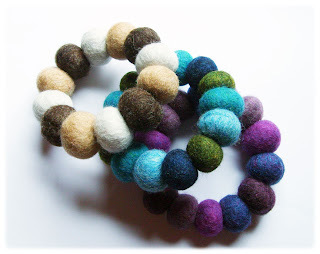 Handmade felted wool bead bangle bracelets - whoa, that's a mouthful! This is what I've been up to in the past week or so. I've been putting some of the felted wool beads that I created during my pregnancy to good use and making some bangle style bracelets. There are also some necklaces in the works which I'll post photos of when they are finished. Some of these bracelets are destined for Eclectics Gallery eventually along with some felted scarves. I hope you have a wonderful weekend! It is finally Fall here in Kansas City, and I'm loving every minute of the cool weather and changing colored leaves. Those bracelets are amazing...enjoy the colours of the days...in Chile spring is coming!!! What a beautiful bracelets! I like the spots on two of them, it's so cute! I just started to work with felt and really happy that I found your blog! So pretty! It looks so simple too. I love making jewelry. Thanks you for sharing.